59 air-conditioned guestrooms at Vivanta by Taj - Kovalam, Kerala feature minibars and CD players. All accommodations have patios. All rooms include separate sitting areas along with sofa beds and desks. Kitchenettes include refrigerators and coffee/tea makers. Bathrooms feature shower/tub combinations with deep soaking bathtubs and handheld showerheads. They also offer bidets, makeup/shaving mirrors, and bathrobes. Wired high-speed and wireless Internet access is available for a surcharge. In addition to ergonomic chairs and complimentary newspapers, guestrooms offer multi-line phones with voice mail. LCD televisions have cable channels, DVD players, and TV Internet access (surcharge). The resort has a private beach. Dining options at Vivanta by Taj - Kovalam, Kerala include 3 restaurants. A bar/lounge is open for drinks. Room service is available 24 hours a day. The resort serves continental breakfasts (surcharges apply). Recreational amenities include a golf course. Also located on site are an outdoor pool, a children's pool, an outdoor tennis court, and a health club. The property's full-service health spa has body treatments, massage/treatment rooms, facials, and beauty services. This 5-star property has a 24-hour business center and offers small meeting rooms, secretarial services, and a technology helpdesk. Wireless and wired high-speed Internet access is available in public areas (surcharges apply). The property has 298 square meters of event space consisting of banquet facilities, conference/meeting rooms, a ballroom, and exhibit space. The property has a train station pick-up service, which is complimentary. Business services, wedding services, limo/town car service, and tour/ticket assistance are available. 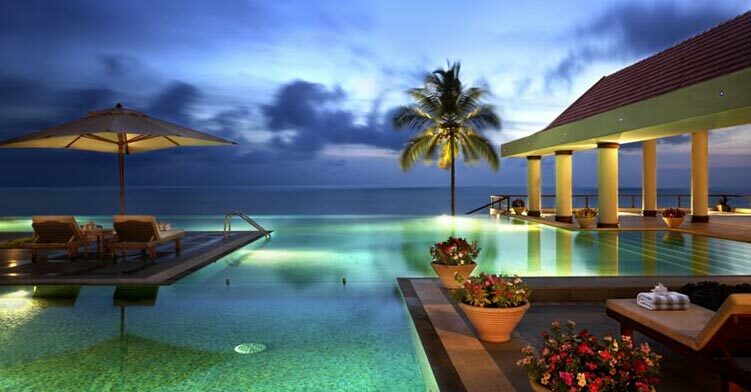 Vivanta by Taj - Kovalam, Kerala is located close to Kovalam Beach, Hawah Beach, and Lighthouse Beach.